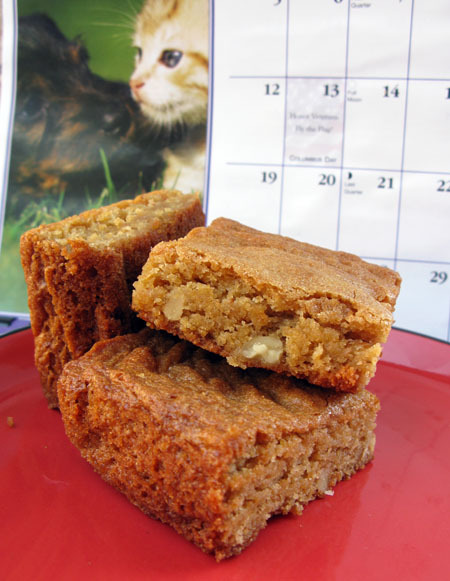 This recipe is supposed to be a Helms Bakery Blondies copycat. That is, a blondie similar to the ones that use to be sold off a neighborhood bakery truck. Also, if you are lucky enough to live in a neighborhood with a bakery truck, give me your address because I’m calling my realtor. All we have is a roach coach which just doesn’t compare. See, I’ve never heard of people going on-line in search of “roach coach” recipes. That Helms truck must have been something. Quick rundown on how these turned out. If you are a blondie aficionado, you might really love these. They had smooth tops, dense & soft centers and the flavor of brown butter and vanilla. I’m more of a brownie girl, so I’d like to hear the opinions of those more into blondies. And do try these, as the recipe is a little different than the usual. Preheat oven to 350 degrees F. Line an 8 inch square metal pan with parchment or line with foil and grease the foil. If you only have a glass pan, preheat oven to 325 F.
Melt the butter in a small saucepan over medium-high heat. Cook an additional 3 to 4 minutes, stirring constantly and swirling pan, until the butter has turned a light golden brown. Remove from heat and beat in the brown and white sugars. Let cool to room temperature. Whisk in the egg and yolk, then the corn syrup and vanilla. Stir in the pecans, then fold in the flour mixture. Scrape batter into a generously greased 8-by-8-inch pan, spreading to the edges. Bake 25- 30 minutes or until top is golden brown and toothpick inserted in center comes out clean. Cool on rack and cut into bars. Note: If you used glass, blondies should take about 35 minutes at 325F. For glass, it’s better to bake “low and slow”. I love your website and made your blondies. These are really tasty and chewy….my fav. These are now my go to blondies. I posted about this recipe in my blog http://www.cuminandcardamom.blogspot.com and referred a link back to your recipe. These blondies are very addictive. Thanks Anna for sharing this great recipe with us. I remember the Helms Bakery trucks! For the bakery unit in school, we all went to visit the bakery as well. We used to buy bread, donuts, etc. The driver even gave out a cardboard replica of his bakery truck for you to assemble. The bakery building still exists in Culver City but now has shops and restaurants. In LA, the “fishman” still goes around selling fish and Japanese groceries. Anna, can I substitute honey for the corn syrup? Corn syrup is expensive in Bangkok. Have you heard of Nemo’s? They’re little squares of cake w/ icing wrapped in plastic. They’re sold at convience stores and drug stores. I’m a cake girl and I remember getting these when I was in High School in San Diego. They have choc. cake, bannana and carrot. I wonder if they’re is a clone of these? Anna, I laughed my head off at your use of roach coach! I thought that was a northeast term! And I thought they got the name because most of the roach coaches that park all over the streets of Philly house roaches. Looking forward to baking the Blondies! I wanted to tell you I finally baked your Best ever Lemon Bars. They truly are the best ever. I will make that recipe again and again. It was like eating Lemon Meringue Pie without the meringue. That said with all my years of baking I don’t believe I have ever made a blondie. Crazy talk! I will definitely have to try this recipe though. They look delicious! Does adding all of these things make them Congo bars instead of blondies?? Is there a difference? Thanks Anna for your wonderful cookie site. I visit you every day! I’ve had a blondie-type thing that I liked, but it was really more like a wet, dense thick chocolate chip cookie than a blondie. I agree with you on the brownie v. blondie debate but I’ve always thought blondies were best as vehicles for ‘other things’like chips–or actually Halloween candy. Blondies with candy corn, chopped peanut butter cups, or chopped Butterfinger bars, Reeces pieces, anything buttery and nutty is yummy. Thanks for stopping by Cookie Madness! I’ll be checking your blog for your blondie recipe. Wow, Joanna! I can’t believe you made them already. Thanks for the report. You are definitely a blondie expert at this point. One thing I forgot to mention is cook time, for my batch, was only 25 minutes. I’m going to note that above. OH yeah, blondies are one of my fave things to bake. I have made several variations of them! So quick and easy and oh so yummy!!! After making like a million batches of blondies for school, I have to say this recipe is different. The corn syrup makes up for the rest of the sugar because there’s usually 1 cup of sugar in all blondies. These are a really nice golden brown and they rose really well! Wow! Those look wonderful. How important do you think that 1T corn syrup really is? I have everything else. I love blondies and these look fantastic! They’d still be good without the corn syrup, right? I had some in my pantry until I read the ingredients list and saw that it contained high fructose corn syrup. The Helms Bakery used to come by my neighborhood . . . ahhhh such fond memories. You used to climb up into the truck and the driver pulled open drawer upon drawer of baked things from bread to amazing glazed doughnuts. The Helms building still exists but has other businesses/restaurants in it now but they did a tribute to it by having a sculpture of the front of a Helms truck coming out of the wall. I parked in the building one day and they had an original truck parked in the lot. It was faulous! It is in Culver City, California. It’s often parked a few blocks away from my office, and her treats are wonderful. The sugar dots are particularly adorable and delicious. The Ice Cream Truck That Wanted to be a Roach Coach. There’s a children’s book there…. Whew! I’m glad the roach coach doesn’t have anything to do with insects. 🙂 I was imagining an exterminator named Roach Coach. Yeah, the Helm’s truck was definitely real. I’m 42 and only know about it second hand, but anyone from Los Angeles over 50 probably remembers it. My great aunt and uncle (my grandma’s sister and her husband) operated a lunch truck in LA in the 50s and 60s. I don’t really remember it but my brother does. There are lots of taco trucks like you describe in LA, wherever there is construction going on. I don’t see it as much here in the Bay Area. I’ll have to check it out next time I’m down in LA! These look great! I actually like blondies more than brownies(can’t handle THAT much chocolate at once!). Oh, and in your catagories section, you have and extra “a” at the end of the word banana. Love the revamped categorization on the side panel!! BLONDIES!!!!! My favorite baked good to make. Wow. So the Helm’s truck is (was) real. About the roach coach. It’s a taco truck that drives around neighboods selling tacos and such. It mainly serves neighborhoods under construction and its target audience is workers. It’s called roach coach because it plays “La Cucaracha”. The Helm’s truck stopped coming by our neighborhood when I was really small, but my grandmother never stopped talking about it! So it was in my conscienceness growing up. Thanks for the memory, I haven’t thought about that in a long time. Great job reorganizing the recipes – it’s really appreciated! You got me thinking here… I don’t know if I’m a brownie or blondie girl… I think I’m like Katrina and like anything sweet (surprise)! Reorganizing the category section sounds like a lot of work, but’s gonna be so neat! The browned butter sounds positively inspired to me! I’m also much more of a hard-core chocolate fan, but may have to try these. Perhaps with brownie batter swirled in? When I was a child, a Helm’s truck came to our neighborhood. That was better than an ice cream truck anyday! I don’t relish what you must be going through on the revamp. It looks GREAT! I too am a “brownie girl” but, I have to say I tried the blondie recipe from a previous post of yours (and I’m not baker) and they were delightful. Now if you could just arrange it with the milk man to deliver them freshly baked, I would be in heaven. I’m not sure what a roach coach is. I’m betting that since I live so far north, it isn’t something I need to know about, and for that I’m grateful. The Blondies look wonderful. I love chocolate, but I also love the last cookie you get when making CCC, and there are almost no chocolate chips in there. I always say I’m going to make the dough and just use toasted pecans instead of chocolate chips, but I never do it. I hate to admit that I have never had a Blondie, so I must make these. Yeah, what’s up with that–a bakery delivery truck–we don’t even have a roach coach around here!